The UC San Diego Health System is following Practice Green Health metrics and will set its own zero waste goals by 2020. How will we get there? With your help! 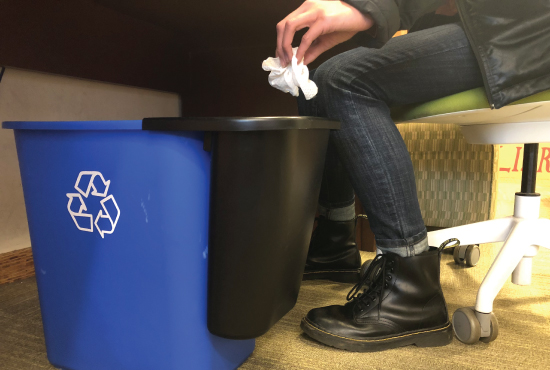 Our Zero Waste Work Group is developing a zero waste plan to help the campus meet these goals by focusing on four key actions: reduce, reuse, recycle and compost. Reduce the amount of single-use and disposable items on campus. Do not give plastic straws at dining facilities and offer paper straws upon request. Refill reusable water bottles at a water refill stations across campus. No need to buy bottled water! Go digital (e.g., putting class materials online via Ted). Host zero waste campus events. We are developing new guidelines for student organization-sponsored and departmental-sponsored events. Use no plastic bags at the Campus Bookstore that sells reusable bags, coffee mugs and refillable water bottles. Offer discounts for using reusable mugs at campus dining facilities. Reuse dishware, cups and utensils in all dining facilities, restaurants and markets. Reuse and repurpose items before disposing of them. Donate unwanted items during spring student move-outs from on-campus residence halls and apartments. In spring 2018, students donated 38 tons of clothing, furniture and other usable items to Disabled Veterans of America ¾ an increase of 7 tons from 2017. Toiletries and other needed supplies to The Hub Basic Needs Center. Donate and share unopened chemicals in labs through ChemCycle. Donate and buy repurposed furniture, electronics, office and lab equipment and more through Surplus Sales. Offer reusable coffee mugs and water bottles through Housing, Dining & Hospitality Services to all in-coming students. Recover edible food for students in need. After opening in early 2018, The Hub for Basic Needs Services worked with the student organization Food Recovery Network to connect over 2,500 pounds of prepared meals from the campus farmer’s market and Faculty Club restaurant to nearly 2,000 students in its first few months of operations. Sell stainless steel reusable straws through the Inter-Sustainability Council and reusable bags through the Staff Sustainability Network at the Sustainability Resource Center. Shop at the Friends Resale Shop and Six Week Swaps at each residential college. Keep boxes, packing peanuts, bubble wrap, and other reusable packaging supplies out of the landfill by accepting and distributing them at the Sustainability Resource Center. Educate the campus community through Green Office and Green Labs certification programs. Will use Bin Buddies in all offices and cubicles. Compost and use anaerobic digestion to turn organic waste into useful soil, fuel or fertilizer. Compost pre-consumer food waste from all Housing, Dining & Hospitality Services restaurants and markets through the City of San Diego’s Miramar Greenery. Compost and use a student-designed anaerobic digester at Roger’s Community Garden and Living Laboratory, part of the Bioregional Center for Sustainability, Planning and Design. Roger’s food waste to food and fuel system converts food waste into renewable electricity, compost and nitrogen-rich organic fertilizer, which are used to grow food onsite for the Triton Food Pantry. Electricity generated by the system feeds batteries incorporated into the garden’s nanogrid, modeled after UC San Diego’s microgrid. Computer science and engineering students are working to automate the system. Student interns and volunteers collect 1,000 pounds of food waste per week from a dozen Price Center restaurant vendors in collaboration with University Centers. Roger’s Garden will soon be taking all compostable waste from the Scripps Institution of Oceanography and takes food waste from large-scale campus events like Wellfest and the annual staff picnic. Are exploring opportunities to add another digester at Roger’s Garden as well as install digesters at other campus community gardens to increase the amount of food waste that can be processed and used on campus to support our zero waste and carbon neutrality goals. Are installing a small anaerobic digester as part of the North Torrey Pines Living Learning Neighborhood project. Housing, Dining & Hospitality Services will operate the digester that will take pre-consumer food waste from the dining hall to provide liquid fertilizer and methane gas for the outdoor grill. San Diego Recycling: What Goes Where?